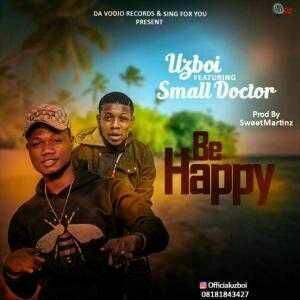 Uzboi finally drops the most anticipated tune with award winning street act, Small Doctor titled ‘Be Happy’ which was produced by the multi talented singer and producer “SweetMartinz”Da Vodio Records and Sing For You-rising Nigerian artiste, UZBOI, is not relenting, he recently drop a love song ‘One Bae’ and has put out new materials to back up his claims as one of the hardest workers in the Industry. Is this a sign of bigger, better things to comefrom the talented Uzboi in no distant time? We definitely think so.Simply stream or download “Be Happy” right away and share your thoughts with usin the comments section below.